These past few weeks have honestly been very eye opening for me. I have always thought of the south of England as the place to be for the discerning foodie to get their ‘rocks off’ as it were and I am not ashamed to say that I wasn’t entirely right. I still think that the south stylises food trends in a way that is hard to match, for instance; The traditional sleepy Devonshire seaside town with its cream tea’s and fish bars, the fashionable edible universe that is Brighton, Food markets and street food gems of London and everything else that incredible big city has to offer. However the UK has thrown me a curve ball in the shape of the walled medieval city of York, and what a place it is indeed. First of all I will say that I know Yorkshire has a lot to offer but I have always just been more drawn to the in vogue south as all of us textbook, cliche foodies are, so apologies to Yorkshire for ever even remotely underestimating your produce. From the moment I got their I was completely and utterly spoiled for choice when it came to choosing our plan of action in terms of where to visit, the vast and rich history seeps out from under every cobble and brick. The Minster has a fantastic presence in the city as its Gothic architecture pierces the skyline from every direction, the walls mark the outskirts and whisper the tales of hundreds of years of marauding invaders with its visible battle scars, weathered but ever present. So many battles that have since been forgotten by the modern world happened in the city, a person would be forgiven for stopping in their tracks while walking the walls, running their hands across the ancient wall and wonder just how many people have done the same over the thousands of years it has existed. All this makes for an incredibly dramatic backdrop for a gastronomically motivated tour of the city. Speaking of which, I guess I should show you some of what we found. First of all, we arrived needing to find something to eat quite badly so it was very much a case of diving in and seeing what we could find. Now there is a LOT to get through so I will give a few mini reviews and tips regarding what to do and where to eat in this post, then finish off with two more thorough, extensive write ups about the top marking places that we discovered during our stay. We arrived early afternoon in York and checked into our bed and breakfast with food already on our minds. We walked around the city scoping out everything available and came to a place called ‘Bagel nash’, a brand that I wasn’t familiar with until I did a little digging. 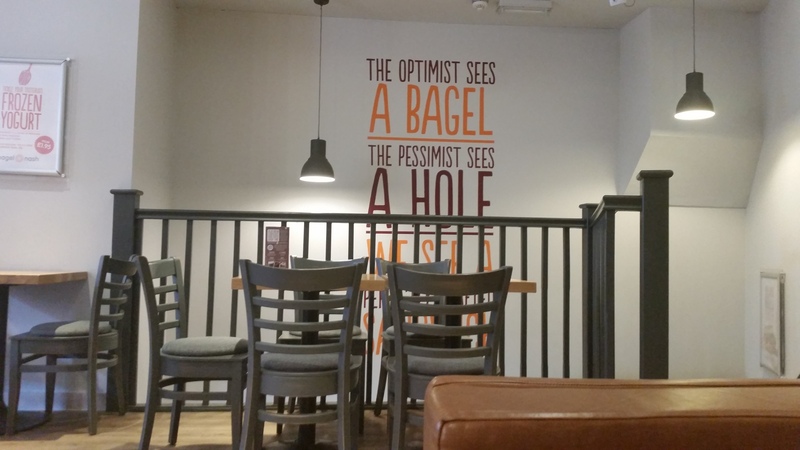 They are predominantly a northern based chain who operate from their Leeds HQ and prepare bagels while you wait, in a sort of ‘Subway’esque way and also have a range of smoothies to go with their extensive bagel and filling options. 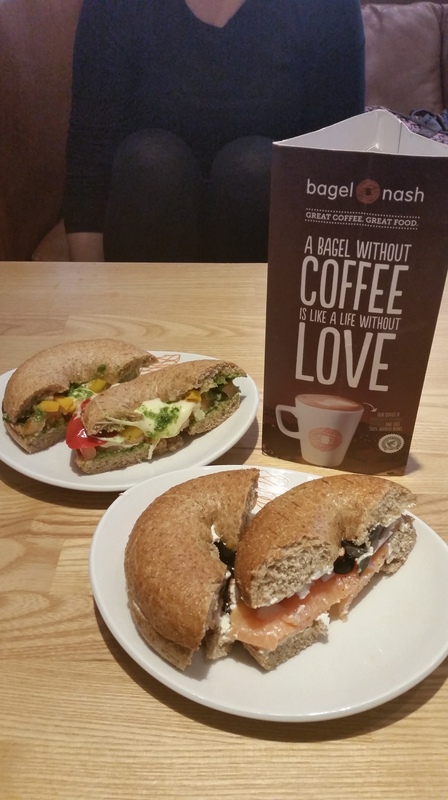 We went for the mozzarella and pesto bagel and the smoked salmon, cream cheese and olive (New york) both on wholemeal, with a fruit smoothie each. It wasn’t a cheap meal for the amount of food that we had but it was very enjoyable filler and it certainly serves its purpose. The decor was modern and quite interesting without being over the top or soulless. Luckily, It also didn’t have any underlying guilt factor like most fast food and it felt like we were only putting good, positive things into our system after a fairly lengthy drive. Overall it was a very pleasant experience and I would encourage you make a visit to them if you get chance. Following this we went for a bit of an exploration around the Shambles, which is a series of lanes, market stalls and eateries that have a more independent feel to them. What a hidden gem the shambles is, although a diamond in the rough in comparison to say The lanes’ In my beloved Brighton, the shambles has a lot to offer. There is so much going on down there its hard to keep track of but its certainly worth a look, every turn of the head presents a new cafe, pub, sweet shop or another foodie oasis in a beehive of cobbles and hungry punters. We didn’t end up eating anywhere around the shambles in the end as we were spoiled for choice and seemed to be a little overwhelmed with choice, while also being short on time trying to pack so much in to a few days. The Shambles is a place well worth a visit and there is a lot available to see, eat and drink. 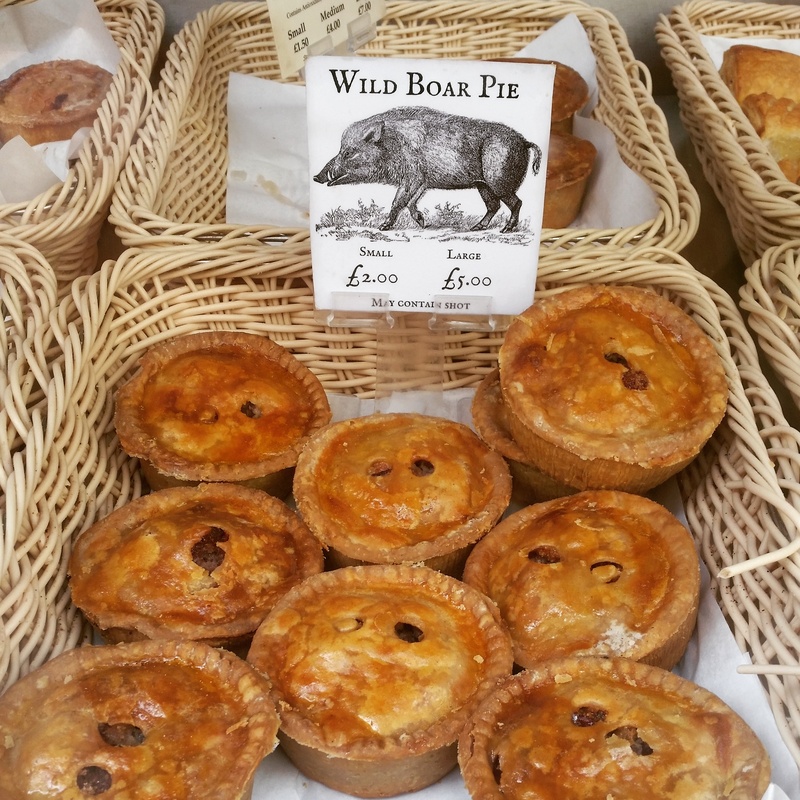 Wild boar pies, found at a pasty and pie shop in The Shambles. Walking around for a while and taking in some of the culture on offer (such as the best busker I’ve ever had the pleasure of coming across playing a full on piano int he middle of the street) I developed a need for coffee and cake. As some of you may know the need for coffee and cake is an insatiable one and in my experience can lead you into two types of places. Really good ones that leave you feeling as happy and satisfied as a ‘pig in muck’ as they say, or alternatively leave you fuller but no more satisfied than if you’d eaten a bowl of dry porridge. It might fill you up but its not good for the soul. 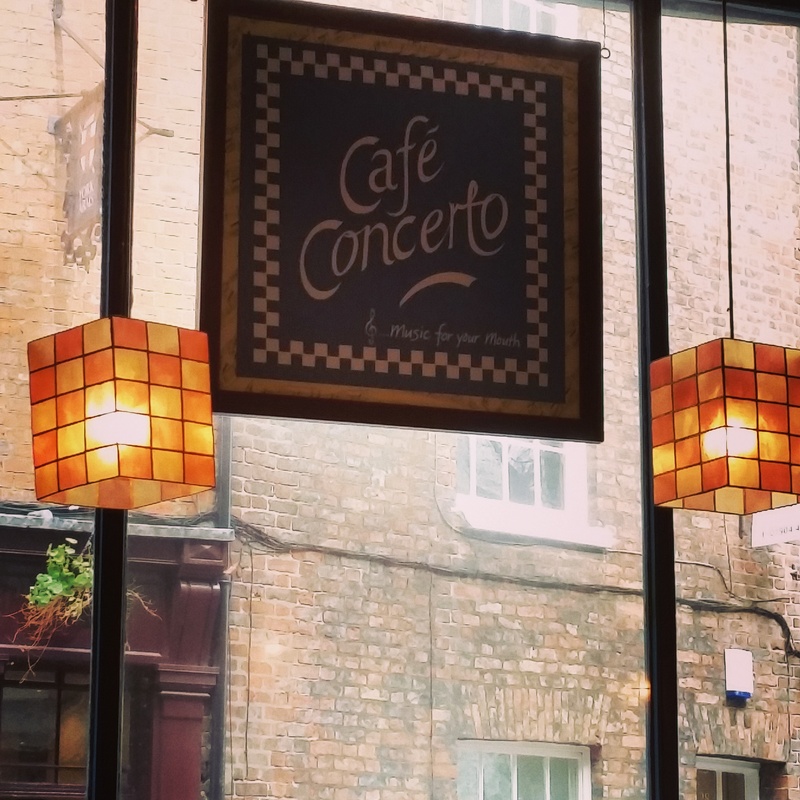 Luckily on this occasion it led us to a little place by the Minster called ‘Cafe concerto’ that comes with tag line of ‘Truly independent -The ultimate neighbourhood restaurant’. This appealed greatly as we saw there was a few attractive options on the dessert menu and tea/ coffee was available too, so we sat down and I ordered the Vanilla and chocolate cheesecake and a cup of coffee while my fiance ordered a tea and a banoffee pie. After a few minutes the desserts were dropped off at our table by a pleasant member of staff and we got stuck in. The cheesecake was a baked new york style vanilla cheesecake with little flecks of chocolate running through it, I find cheesecakes can be a little too much towards the end but this one was enjoyable all the way through. I found it wasn’t overly dense which is usually a bit of a bug bear when it comes to cheesecakes and the biscuit base was pretty good too to be fair, even better when paired with a coffee. My partners banoffee pie however was just too sickly for me as it was just a bit too sweet, if you like a lot of cream and to take sweetness to the next level then that is the best choice for you. Just a bit too rich for my blood I think. Decor was a bit ‘woody’ but it was really a nice place to be. Its a little bit out of the sun so it can feel a little dark in there but its certainly not dingy, the wooden chairs aren’t the most comforting but the service and food on offer is warming enough, paired with the cool ‘chalky’ drawing of the Minster and the sheet music used as wallpaper it provides a very intriguing, jazzy feel to the restaurant which I love, being a musician myself. Very much enjoyed our visit here and would recommend you give it a try, its got a real individual personality and should be appreciated for it. Support the real independents! 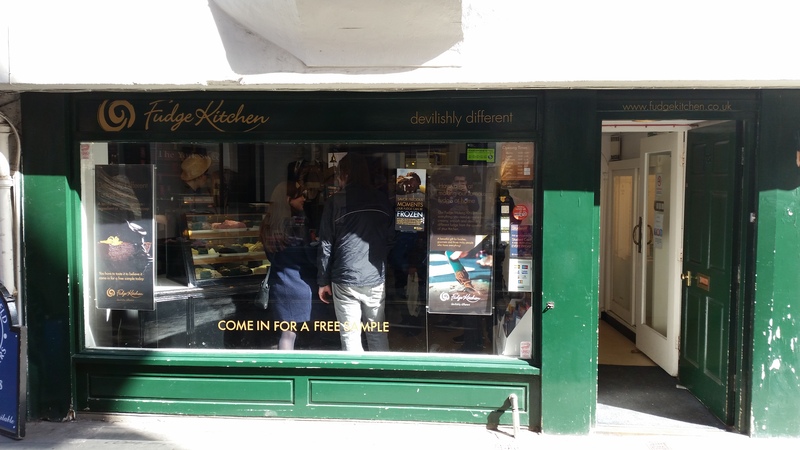 One for the sweet toothed confectionery hunters out there, The Fudge Kitchen uses their own take on fudge to provide something a little bit different. They provide plenty of choice in terms of interesting flavours and even have a viewing area in the back of the shop so you can watch them make it. In terms of the quality of their fudge I must say its very good and is well worth poking your head around the door for a sample. 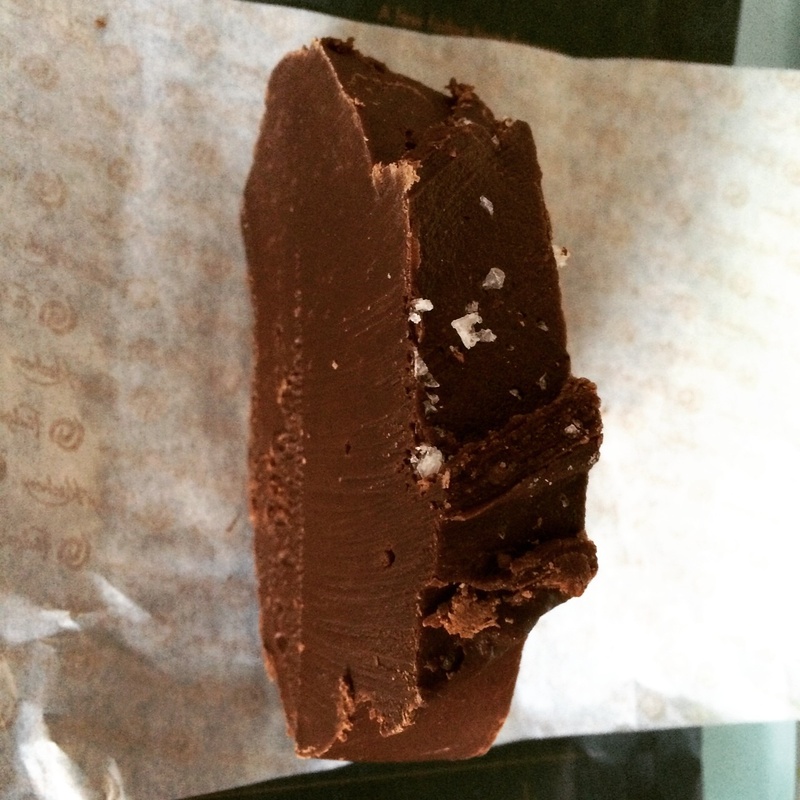 We went for the dark chocolate and sea salt. Very creamy and quite moreish but you will have to go in and see them if your a fudge fan, well worth a look. You can also buy online (go to the bottom of the page). 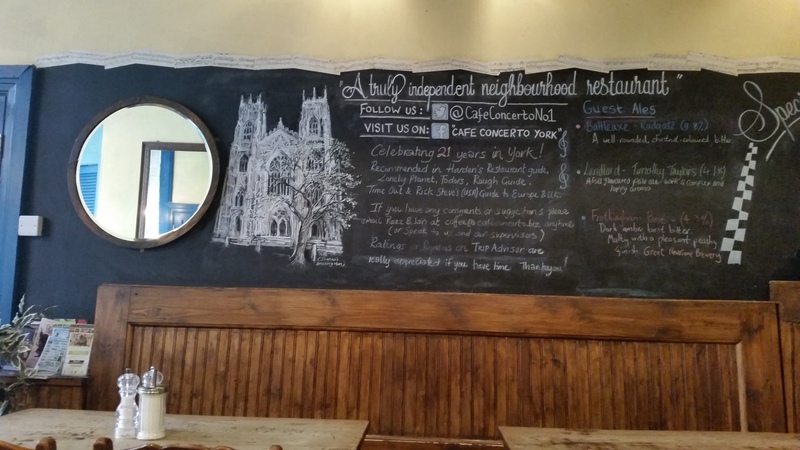 These are a few of the notable stops that we took while in York and would genuinely recommend you have a look at if your in the area. The historical atmosphere and bustling city streets is a real treat for anybody who decides to visit, it is a fantastic place that really should be seen to be appreciated. I have two more reviews to go but I will be putting that into a ‘part two’ post this week, as this post is getting quite long and I want to go into a lot of detail on the final two restaurants. Nobody wants readers fatigue after all! The final two big hitters that I have left to write about that really impressed me were La Vecchia Scuola and GBK: Gourmet burger kitchen. 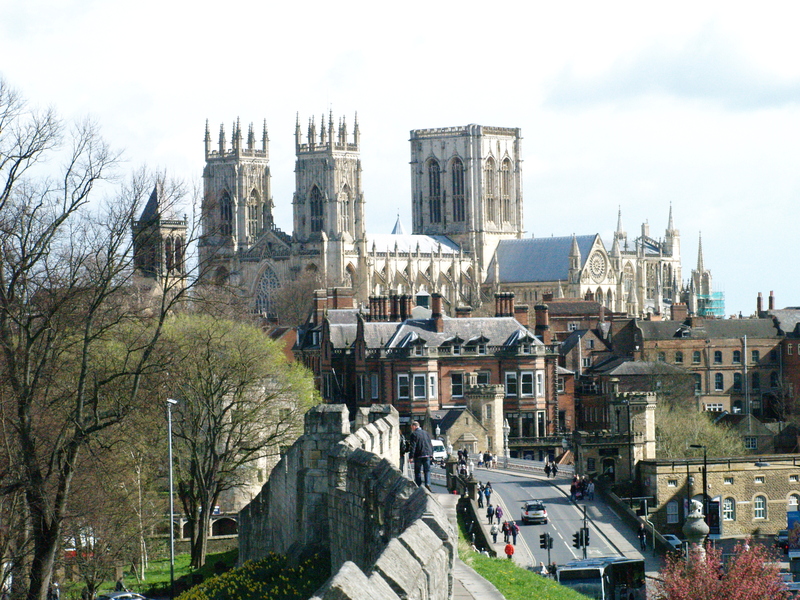 Keep your eyes peeled for comprehensive reviews on them both at a later date, In the meantime here are a few useful links if you are interested in traveling to York. This entry was posted in Uncategorized and tagged ancient, article, bagel, bagel nash, bank holiday, boar, buck, building, cafe, cafe concerto, Cake, cheese, cheesecake, coffee, concerto, confectionary, cooking, e ating, eatery, england, Food, food tourist, foodie, fudge, gothic, history, Holiday, hungry, hunry buck, kitchen, minster, music, olivers, pie, restaurant, review, road trip, romans, salmon, sweets, tour, tourism, tourist, travel, uk, vikings, visit, visit england, visit york, wild boar, wild boar pie, write up, york, yorkshire. Bookmark the permalink.